Feast your eyes on the Deluxe High Back Stool Beige Fabric, a marvellously modern model that embodies the very best in contemporary design. 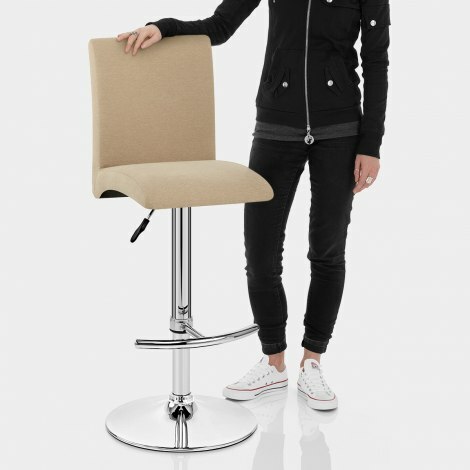 An impressive blend of comfort, support, and style, the Deluxe High Back Stool is a simply incredible piece. The beautiful beige fabric will add a light accent to any interior, whilst the ergonomically crafted high backrest cuts a sophisticated concave silhouette and is padded for quality comfort. The cushioned seat is set on a single stem, its polished chrome surface delivering a sleek reflective finish. 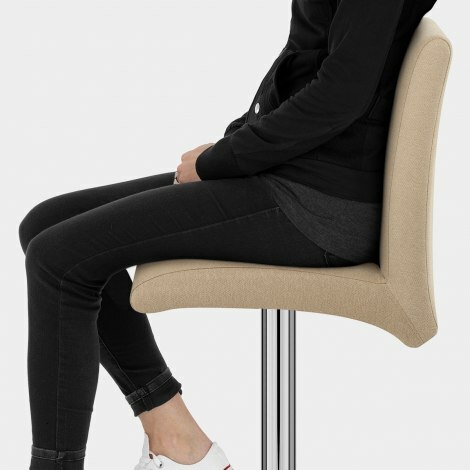 Versatile and adaptable, the 360 degree swivel and gas lift mechanism provide first class functionality, whilst the curved T-bar footrest offers much needed support for the feet. With a protective rubber ring on the underside to help defend floor surfaces, the Deluxe High Back is not to be missed. "Highly recommend the company and product"
Arrived promptly with advanced warning. Product as shown and reasonably easy to assemble.